After telling us the story of the shepherd and his lost sheep, Jesus dramatically introduces a second story, this time of a woman and her lost coin. Two questions we will try to answer are, 1.) Why does Jesus tell a story about a woman, and 2.) What are the similarities and differences of this story to the lost sheep story? First, let us set the story in a cultural background. The story takes place near Capernaum, around the Sea of Galilee. The house that the coin would have been lost in would have been a small, one room, stone structure common to the area, with walls, floors, and ceilings all made out of black basalt rock. The only natural light came from small ventilation slits in the rock walls. With black walls and floors and little light, it is easy to see how a coin could be lost and and a lamp needed to look for it in the dark. The coin named here is a drachma and one drachma would be approximately one days wage. In all likelihood, the woman was married and was trusted by her husband to handle the family money. Similar to the Proverbs 31 woman, she was in charge of the household and an important figure in the Galilean family. Why did Jesus tell a story about a woman? He certainly could have continued his theme from the previous story and told of a man who lost a coin instead of a woman. One answer is that women were just as important to Jesus as men. Indeed, the whole New Testament is careful to give women a place of equality with men. Jesus had several women among his band of disciples (Luke 8:1-3; Matthew 12:46-50; Luke 10:39) and Luke records in Luke 8:3 that some of the women were actually financing the movement! Jesus definitely had a commitment to communicate with women on as deep a level as men. In this parable, Jesus affirms this commitment by likening himself to a woman who searches for something that has been lost. The Hebrew Scriptures always characterize God as a person, not just an impersonal force. To show what God is like as a person, the Bible uses metaphors to describe his personality and character. As we discussed in a previous post ( “Our Father”), the Hebrew Testament often portrays God as having female characteristics. From the beginning, in Genesis 1:27 it says that, “God created humankind in his own image…male and female he created them”. Psalm 131, Isaiah 42:13-14 and 66:7-13 are all examples of God having the nurturing and motherly qualities of a woman. It was no coincidence that God likened himself to a good woman as the hero of this story. Just as God (and Jesus) was the good shepherd in the first story, He also becomes the good woman in the story of the lost coin. 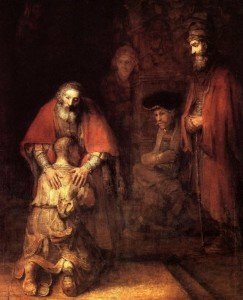 What message was Jesus trying to communicate in this story? The lost coin story is similar in most ways to the lost sheep story, but it definitely has some new elements that are put in. As we have just discussed, the hero of the story is a woman and not a man. This parable introduces the element of faulty leadership discussed in our previous post that is found in the Isaiah and Jeremiah sheep stories. The woman is careless and loses the coin as opposed to the lost sheep wandering off on his own. Also, the coin has no ability to find itself. It cannot flip out of the crack or make a cry to help being found. It is all up to the woman and her diligence to find the lost object. The idea of grace is certainly emphasized here as the coin can do nothing to affect the outcome of salvation. The joy of restoration is very present in both stories. Just like the shepherd. the woman and her friends rejoice over finding the lost coin. This is definitely a metaphor for what happens in heaven when a lost sinner is restored. How could the Pharisees and teachers of the law fail to rejoice also? In this second story of “lost and found”, Jesus adds to the metaphor of what He and His Father are like by introducing the personality of a good woman. In the first story He is a good shepherd and now He becomes a good woman. He wants the listeners to know that He and God have motherly qualities as well as the more obvious male attributes that you would expect from a great teacher. Both His male and female listeners are now intimately involved in His story. In my next article, we will turn to the final story in the trilogy, which is the climax of the parable, and see the culmination of Jesus’ answer to the question that the Pharisees had as to why He ate with tax collectors and sinners. If you will remember in our previous lesson we saw that the three stories found in Luke 15 are really one parable that Jesus told in three parts to explain to the Pharisees why He would eat with sinners. Jesus begins his explanation by telling the story of the good shepherd and his lost sheep. As we study this story, remember that Jesus’ overarching goal is to explain in a systematic manner to the Pharisees and the teachers of the law why he is associating with what the Pharisees called , ”the people of the land”, or the common, unlearned folk. In this story of the Lost Sheep, Jesus is retelling a classical story already well known to His listeners. This theme of the shepherd and lost sheep was a very common one in the Hebrew Testament. Psalm 23, Jeremiah 23:1-6 and Ezekiel 34:1-31 all have the same characteristics and elements as this lost sheep story. Although we don’t normally think of Psalm 23 in this light, a closer look will show that lost and found is definitely the point of the 23rd Psalm. The key is found in verse 3, where it is translated, “He restoreth my soul”. The Hebrew word that is translated restore is “shuwb” which means to repent or return. Middle Eastern and Arabic translations of this verse have always said, “He brings me back”, or “He causes me to repent”. If this is understood, then the theme of Psalm 23 becomes the same as Jesus’ parable of the lost sheep. 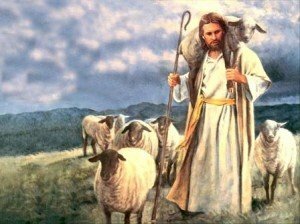 The good shepherd goes out and brings back the lost sheep. The next set of verses in Psalm 23, “He leads me in the paths of righteousness” expand more on that subject. The assumption is that the psalmist was walking in paths of unrighteousness. The good shepherd went after him, picked him up and carried him to the righteous or correct path. The shepherd caused the sheep to repent and return. Psalm 23 also closes with a meal and rejoicing, just like the parable of the lost sheep. The hearers of this lost sheep parable would have been very familiar with this type of story and would have been asking themselves,”Where is he going with this?”, and who is the shepherd, and who is the sheep? With this background and knowledge of the Bible’s sheep stories, what would the Pharisees have thought when they heard Jesus’ story of the lost sheep, after they had complained about who He was associating with? They would have heard Him say through this parable, “I am God; I am the one that God has sent to rescue His lost sheep, the ones that you have been abusing”! Jesus was saying that He was the fulfillment of God’s promises spelled out in Psalms, Jeremiah and Ezekiel, that He (God himself) would come to His people and personally seek His lost sheep. Jesus would have been saying, “This is who I am and this is the reason that I am doing what I am doing.” There is no question that Jesus was talking about Himself in this parable. As the good shepherd, He is the one that God sent to restore lost sinners to God. Jesus personally paid the great price and made the costly demonstration of love to save the helpless, lost sheep. The joy that was felt in the home of the shepherd was equated to what the joy in heaven would be like when a lost sheep was found. But Jesus is not finished. After this wonderful story of sheep and shepherd, lost and found, love and redemption, He dramatically introduces a second story of the good woman and the lost coin. 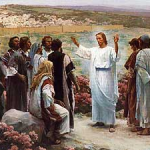 Our next lesson will examine this next story in Jesus’ reply to his astute audience of Pharisees and the teachers of the law. Over the centuries since Christ lived on the earth the church has studied the stories of Jesus to try to determine and understand who He was and is. Scholars across the ages have examined everything they could about Jesus in an effort to unlock the secrets and meaning of his life. These gems are found scattered throughout the New Testament in Jesus’ sayings. They are just waiting to be discovered by the reader who knows where to find them in the Old Testament. Unfortunately, most of us don’t know our Hebrew Testament very well, so we don’t realize what passage that Jesus is referring to or drawing from. We’ve got to do the hard work of digging through the Scriptures to find out what Jesus was saying about Himself. The deeper we dig, the deeper the story gets. The nuggets are there in the pages of the Bible, just waiting for us to find them. Don’t wait for your pastor to find them for you. Get started for yourself! You will find that the Bible is one big story, all intricately woven together by the master story teller himself, just waiting for you to discover it. Start digging! Start mining the scriptures for those nuggets! He hides them so that we will seek! It is our job to dig them out.